Travertine is a natural stone flooring product that is popular with homeowners because it’s durable and easy to lay. There are differences between travertine and natural marble, but which of these flooring products should be used in different rooms of your house? There are loads of different types of flooring which are suitable for use in homes and offices. The choice you make will mainly depend on the appearance and your personal preferences. You will also need to consider the amount of traffic your floor receives and whether or not you have kids. Travertine is a very similar product to marble in some respects. Both travertine and marble require regular maintenance to keep them in good condition. Marble was once a very posh flooring material which was only ever found in mansions, however these days many normal houses are using marble as a flooring option. It’s perfect if you have children or animals and works well in very hot or cool climates. Marble is more than just a flooring material, it will actually add value to your home. Many different types and colors of marble are available. When installing marble floors it’s important that it is done professionally. Marble is an expensive material and needs to be treated properly with regular cleaning and maintenance. Marble is a surprisingly a porous material, which means it can stain if not treated properly. Travertine has been used for many centuries. It has been used by the Romans to create the coliseum and many other surviving antiquities. Travertine can be found in natural or polished finishes depending on the look you are trying to achieve. When you are installing either natural travertine or marble flooring, there are some very important things that you will have to bear in mind. First, both of these products are heavy. Make sure you can physically lift them before starting the installation project. You will also need to use a very strong adhesive to hold the tiles in place. Standard ceramic tile adhesive simply won’t do. Natural products are easier to match because the colors remain much more constant than man made floor coverings. This means that you don’t have to worry about buying a specific batch or color number. Whether you choose marble or travertine, the most important thing that you need to do is seal it. All natural flooring products are porous and this makes them susceptible to stains and other damage. Choose a stain which is suitable for your flooring material and ensure that it is used as directed. This will give your flooring all the protection it needs and it should be able to last for many years to come. If you are ever in doubt abut the flooring products that you should use, you can always ask for help and advice at your local home hardware store. 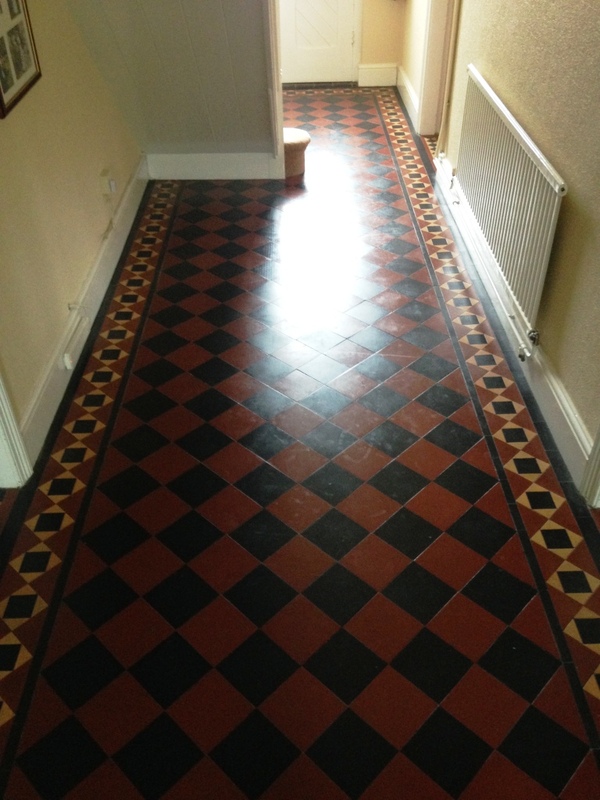 This black and red Victorian tiled hallway at a property in Newport, the third largest city in Wales, had a timeless charm about it, and a classic diamond pattern. Unfortunately, the tiles had lost their colour, leaving them looking dull and lifeless. It was clear to me, upon further inspection, that the existing sealer had failed, allowing dirt to become trapped in the pores of tile. This can be a very difficult problem to rectify without the right professional assistance; everyday household cleaners are rarely suitable for sealed floors and acidic cleaners can actually male the problem worse. The tiles needed a deep clean with strong products, followed by a fresh, robust surface seal to prevent dirt from becoming trapped again in the future. I started cleaning the tiles with a strong dilution of Tile Doctor Pro Clean, worked in to the stone as per usual by using a rotary machine fitted with a black scrubbing pad. Pro Clean is a reliable alkaline cleaner that works well on most kinds of natural stone, and while I could see it made a difference here, it was clear something stronger was required to remove what was left of the old sealer. To remove this, I applied a dilution of Tile Doctor Remove and Go, which is a dedicated stripper that is safe to use on tile and stone for the purposes of breaking down old sealers, waxes, paints, and adhesives, and this proved effective in getting rid of all the old sealer. Once the cleaning was complete, I rinsed the floor thoroughly to remove any trace of chemicals left over from the cleaning products, before leaving it to dry overnight. I came back to the property the next day and, after checking the floor was completely dry, I proceeded to seal the floor using eight coats of Tile Doctor Seal and Go. This types of sealer is known as ‘topical’, which means that it builds up a solid layer of protection on the surface of the tile. 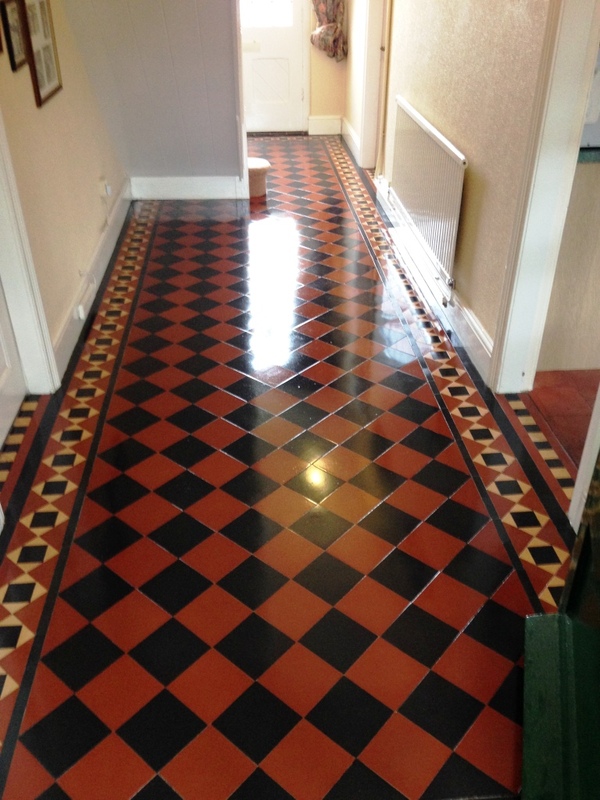 Topical sealers tend to be more suitable to Victorian and Quarry tiles as they typically require a lot of sealer due to their porosity and these types of sealer are less costly. Seal and Go also adds a nice aesthetically pleasing low sheen finish. As you can see from the second photo, this did wonders to the tiles and really brought this classic Victorian pattern back to life. Another satisfied client for the Monmouthshire Tile Doctor.